On 7 January, security forces arrested a former member of Ansar al-Sharia, Amad al-Ghariyani. On 2 January, Nigeria’s Defence Minister, stated that several Nigerien solders were attacked by ‘fundamentalist’ fighters based in Libya. On 25 June, Haftar received a UAE Armed Forces delegation led by Deputy Chief of Staff Major General al-Mazrouei just one month after Egyptian chief of staff visit. Two prominent Zawiyyan militia members detained by authorities in Saudi Arabia on return from pilgrimage. Haftar and the LNA attempt to exert their influence in western Libya, announcing that a new offensive to take Tripoli is ‘imminent’ and mobilising LNA forces south of Zawiyya. 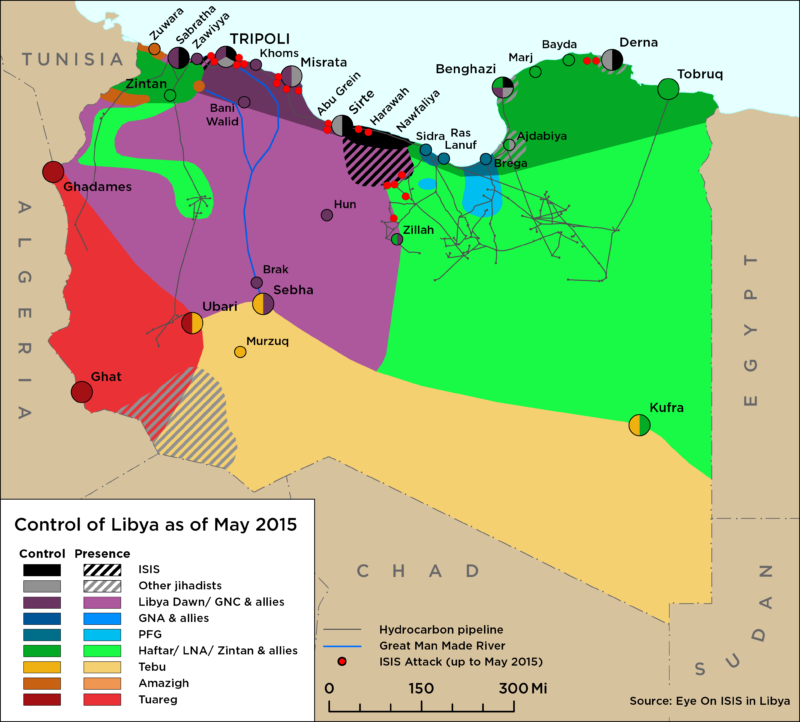 On 3 April, the Libyan National Army (LNA) announced the launch of its long-anticipated operation in western Libya. On 4 April, LNA leader Khalifa Haftar released a statement declaring Operation “Flood of Dignity” to liberate Tripoli. On 29 March, Haftar states that within two weeks there will be a unified government in Libya. On 31 March, the LNA’s 155 Battalion, declared to the LNA Central Command its readiness for mobilising. On 30 March, elections for nine of the 69 municipals councils in southern and western Libya took place. On 17 March, the eastern-based Interim government’s launched a security operation to remove “terrorists and criminals” from Libya’s South. On 13 March, al-Bunyan al-Marsous spokesman stated that an attack on Sirte by the LNA would be a declaration of war. On 15 March, the LNA released three Zawiyyan prisoners from Qirnada Prison in eastern Libya. On 18 March, the PC has agreed on a budget of around 48.6 billion LYD for 2019. On 7 February, the LNA extended its reach towards the Sharara and al-Feel oilfields. On 9 February, the LNA air force carried out airstrikes near al-Feel airstrip. On 11 February, a deal was struck between the LNA and the unit that currently guards Sharara. On 8 February, the TPF announced that it would be integrating into a new, larger coalition and the 301 Brigade took positions in southern Tripoli. The Libyan National Army (LNA) mobile force continued to advance southward into the Murzuq region last week. 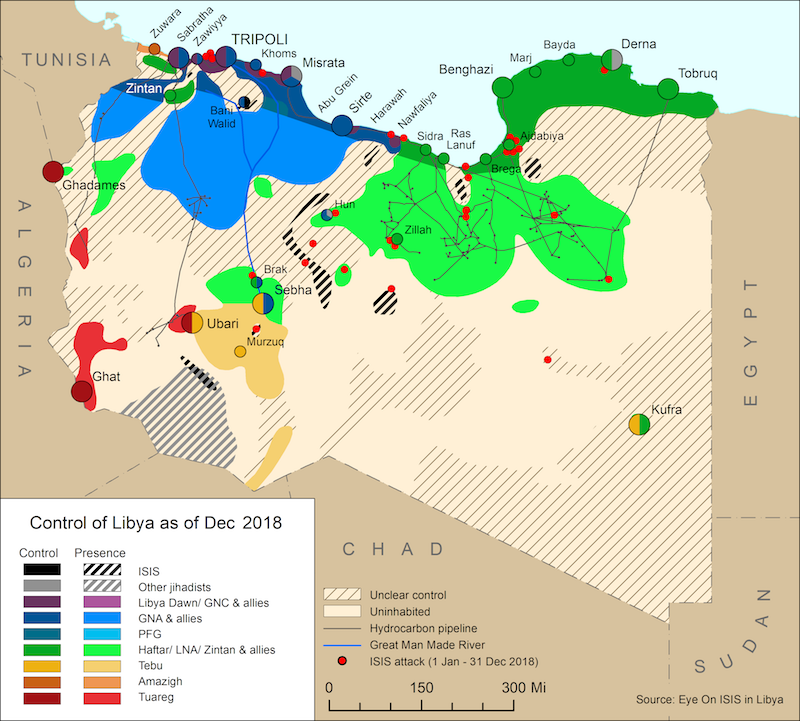 On 30 January, LNA spokesman stated that the LNA now has three axes of connection to Libya’s western region coinciding with several declarations of support for the LNA in the region. On 2 February, the GNA’s Chief of Staff stated that the GNA was not coordinating with the LNA in the south. On 15 January, LNA confirmed that an operation to liberate southern Libya from “terrorist” groups is underway. On 8 January, the LNA’s Military Police Brigade was deployed to Ras Lanuf and Brega to facilitate security in the Oil Crescent. On 8 January, three Presidential Council members instructed all government staff to cease supporting PC head Fayez al-Serraj. On 9 August, the House of Representatives (HoR) Committee of Foreign Affairs and International Cooperation declared Italian Ambassador Giuseppe Perrone as a ‘persona non-grata’. The decree is in response to his comments last week that were widely interpreted as dismissing Libyan elections. On 5 June, U.S AFRICOM conducted a drone strike near Eshmikh, 35 km south of Bani Walid, killing four alleged ISIS members. On 6 June, the UN Security Council (UNSC) gathered to discuss the results of the 29 May Paris summit on Libya. On 7 June, the UNSC Libya Sanctions Committee added 6 individuals to their sanctions list. On 9 April, the spokesperson for Presidential Council (PC) reported that the PC’s new anti-terrorist operation had completely removed all elements of terrorist organizations in its operation area. On 8 April, Khalid Mishri was elected as the President of the High Council of State. On 4 April, a Libyan delegation met with representatives from Sudan, Niger, and Chad in the Niger and made an agreement to create a cooperation mechanism to secure common borders. On 20 March, the sixth round of discussions aimed at unifying Libya’s military concluded in Cairo. On 19 March, Zintan Special Forces led by Emad Trabilsi took control of the 27km checkpoint on the main Tripoli-Zawiyya coastal road. On 21 March, a so-called “Ceasefire Committee” created by the Presidential Council arrived in Sebha to negotiate peace between the clashing Awlad Sulieman and Tebu tribes. On 26 February, Libya’s National Human Rights Commission confirmed that two civilians have been killed in clashes between Awlad Suliman’s 6th Brigade and Tebu militias in Sabha. On 21 February, a prominent militia leader from Warshefana was killed in an arrest operation in the al-Maya district west of Tripoli, leading to the coastal road being closed. On 15 February, in Tripoli Serraj dismissed the current GNA Minister of Interior al-Aref al-Khoja from his post and replaced him with his deputy minister Brigadier Abdussalam Ashour. The GNA also promoted Sabratha’s Anti ISIS Operation Room Commander Omar Abdul Jalil to Brigadier General and is actively reorganising security architecture Sirte. On 14 February, the Supreme Court in Tripoli ruled in favour of the CDA’s draft constitution.